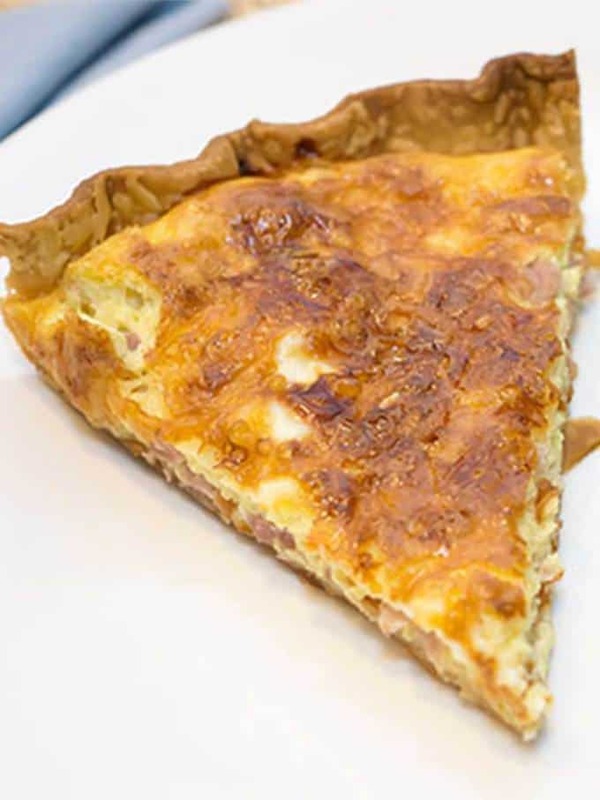 Ham and gruyere quiche is simple to make and delicious to serve. It only has a few ingredients, and is perfect for a Mother’s Day brunch. 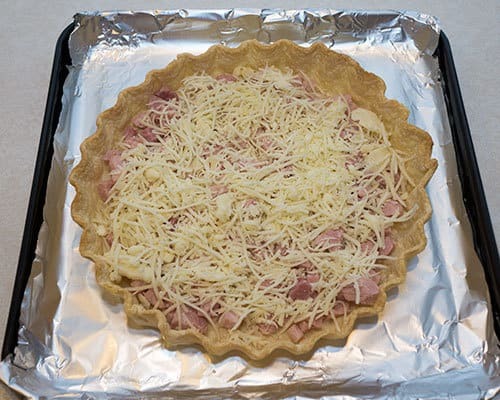 I used the following ingredients: Store-bought pie crust, ham, Gruyère, eggs, and half and half. If you don’t have Gruyère, you could use Swiss cheese or Emmental. When I make a quiche, I find that pre-baking the pie shell several hours before actually making the quiche works the best. This gives the crust time to cool completely, and aids in retaining its shape. I follow the Alton Brown philosophy of using store-bought pie crust as opposed to making my own! 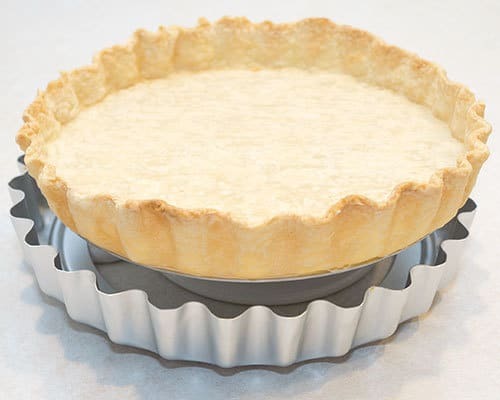 Also, I tend to use a tart pan with a removable bottom as opposed to a pie pan because I like to bake the quiche just in the shell, out of the pan. However, the pie pan works just as well. I lined the bottom of the tart pan with parchment paper to make it easier to remove the baked shell from the bottom. 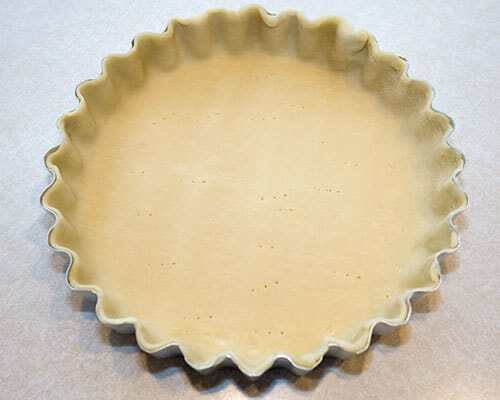 Once the pie crust had been out of the refrigerator for 15 to 30 minutes, I carefully unrolled it and placed it in my 9-inch tart pan. I pressed the sides to the pan and pierced the bottom several times with the tines of a fork. To try to minimize the shrinkage from the sides during baking, I placed the pie crust in the freezer for about 30 minutes. 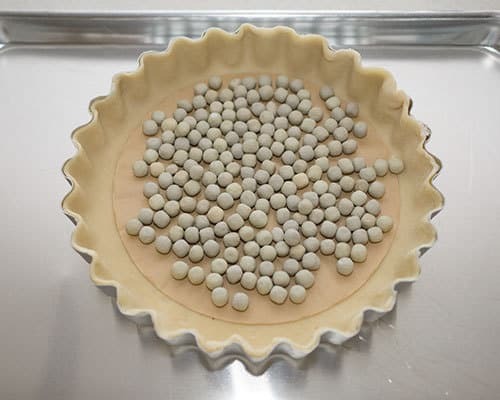 Right before baking the pie crust, I lined the bottom with a coffee filter and covered it with pie weights to ensure the bottom didn’t puff up during baking. You could just as easily use parchment paper or aluminum foil, and dried beans. I baked the crust in a preheated 450° F oven for about 12 minutes, until it was golden brown. Then, I removed it from the oven, and let it cook completely. When I was ready to fill the pie crust, I placed the tart pan on an small upside down bowl. 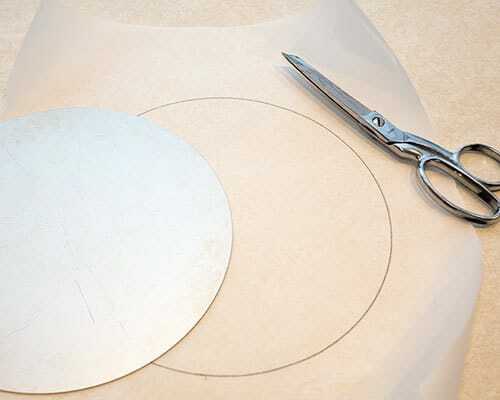 This allowed the rim of the tart pan to fall, leaving behind the tart shell on the removable bottom. Before filling the tart shell, I removed it from the bottom of the tart pan and parchment paper. Then, I placed it on a baking sheet that had been lined with non-stick aluminum foil. First, I added the ham that I had cut into small pieces. Then, I sprinkled on the shredded Gruyère. Finally, I added the custard made with the eggs and half and half. 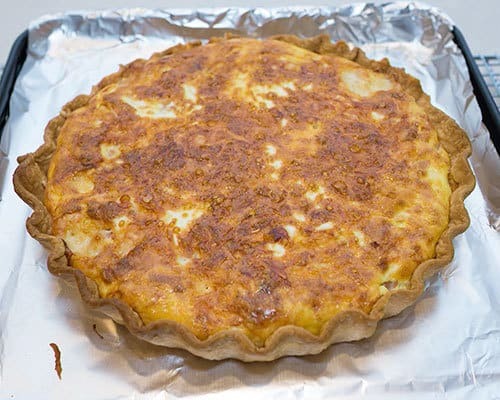 I baked the quiche in a preheated 375° F oven for 35 minutes, until it was nicely puffed and golden brown. I let the quiche sit for about 10 minutes before serving it with a Caesar salad. Yum! 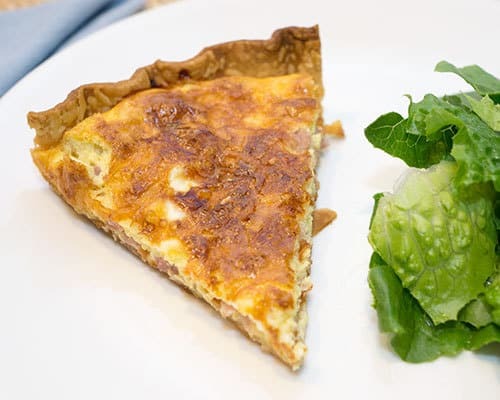 Ham and Gruyère quiche is simple to make and delicious to serve. It only has a few ingredients, and is perfect for a Mother’s Day brunch. 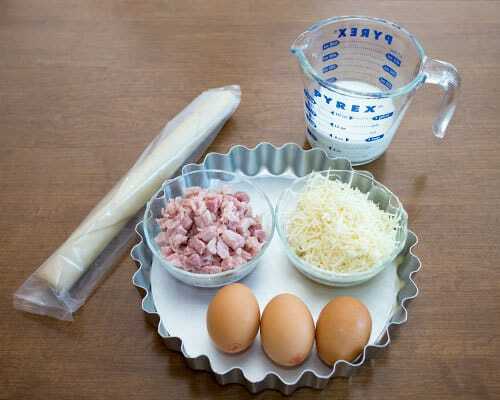 Preheat oven to 375° F. Whisk together the eggs and half and half. 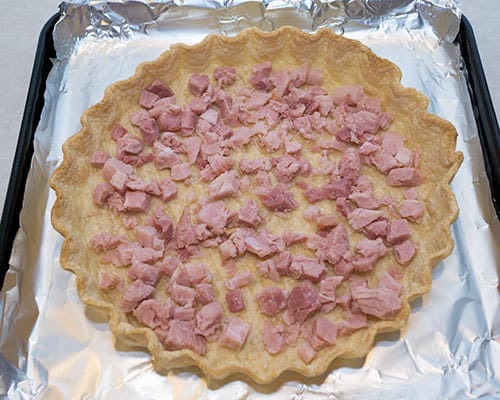 Sprinkle the ham on the bottom of the pie shell. Sprinkle shredded Gruyère on top of the ham. 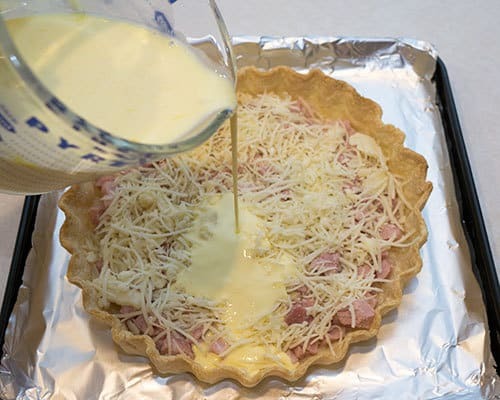 Pour egg/half and half custard into pie shell. Bake for 30 to 35 minutes, until top is nicely puffed and golden brown. Remove from oven. Allow to cool 10 minutes before serving.